Georges Simenon (1903-1989) was the author of some 400 to 500 books, many penned under a nom de plume in the early days. Sales of his Inspector Maigret series run to 853 million, nearly twice as much as total sales of the Harry Potter books. The approximately 80 Inspector Maigret books in existence are currently being issued in new translations by Penguin Classics – the run will end this year - while over 100 of the author’s romans durs or "hard novels" are published by Penguin and NYRB Books. John Gray, the eminent English philosopher, has been a keen fan of the works of Georges Simenon for decades. He is interested in both the Maigret novels and the so-called romans dur, or ‘hard novels,’ which the great Belgian writer tended to work harder at. Inspector Jules Maigret has a sort of incidental glamour about him and people occasionally recognise him from media appearances in connection with celebrated murder cases. Yet Maigret stories are the antithesis of Montalbano-style allure and charm and the appeal resides in how real everything seems, humdrum even, like ordinary life itself. The Inspector does not stand out from the crowd like an action hero, rather he looks to us like the man in the street, maybe an authoritative, purposeful man in the street, catching a bus, calling a taxi, drinking a beer. He has no aspirations to run away from his cosy domestic existence, unlike the tormented male protagonists in M Monde Vanishes and The Man Who Watched The Trains Go By. The more considered, existentialist Simenon novels, such as the latter two, were enthusiastically lauded by the eminent French novelist André Gide. The novels tend to have flawed heroes and their narratives do not concern themselves much with the minutiae of the police chase or the inevitable hunch that clinches Maigret’s police investigations. They can be melodramatically lurid, truth to tell, and the reader may find that they lose sight of the protagonist in the sometimes garish action and endless risk-taking. "That is one reason why Simenon’s work does not belong in the genre of crime fiction, "Gray writes in a New Statesman piece. "In the romans durs, criminal acts are important only in signifying a final break with society. Even in the Maigrets, the question is not why a crime was committed, but how the person who committed the crime departed from a settled routine of living, and the detective resolves the conundrum by imaginatively entering into the life of the suspect." Jake Kerridge, assessing the fiction of Simenon in the Daily Telegraph, makes a similar observation about Inspector Maigret, who is inclined to rely on instinct when solving a crime, rather than on strict method. He tends not to make Sherlock Holmes-like deductions. Instead, according to Kerridge, he guesses at the culprit’s identity "by empathising with what makes the criminal commit the crime – and this act of empathy makes him unable to pass judgment on the wrongdoer." 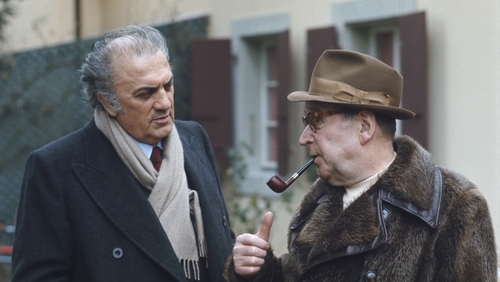 "For 30 years I have tried to make it understood that there are no criminals " Maigret declared provocatively In 1970. Maigret and the Good People of Montparnasse, Maigret and The Lazy Burglar and Maigret and the Saturday Caller number among three recent issues. In the first of these, originally published as Maigret et les braves gens in 1962, ‘the good people’ puzzle and almost irritate our Inspector. The Josselin family’s air of respectable normality acts as a cloak, distracting the Inspector from his attempts to discover why the paterfamilias, René Josellin was murdered in his armchair at the family apartment in Montparnasse. In Maigret and the Saturday Caller, which was first published in 1962 as Maigret et le client de samedi, ‘the Saturday Caller’ of the piece is the painter and decorator Monsieur Planchon who calls somewhat unusually to Maigret’s apartment. His curiosity piqued, the Inspector decides to entertain Planchon’s concerns. He nervously tells the Inspector that he wants to kill his wife and he seems to want to be dissuaded by an authority figure such as Maigret – he has thought too of confessing the plan to a priest. Planchon has never been confident with women, due to self-consciousness because of his harelip. As it happens, he is being cheated on by his wife who is the lover of the 29-year-old handsome workman whom he himself employed. He is so bullied by his spouse, or cowed by his domestic circumstances that he sleeps on a camp bed in the apartment where wife and lover sleep in the marriage bedroom. Maigret gingerly follows the situation as it evolves towards a murder which he cannot prevent. In Maigret and The Lazy Burglar (Maigret et le voleur paresseux, 1961) the inspector is distracted from investigating the activities of a veteran gang leader by news of a gentle "lone wolf" burglar who has been found dead in the Bois de Boulogne and with whom he has crossed paths previously. As the novel opens, Maigret is woken by a phone call from a colleague in the middle of the night at his apartment - 15 novels in the Maigret series, incidentally, begin with such a nocturnal rousing. John Gray salutes the new Penguin translations, remarking on `the uneven quality’ of previous versions in which some narrative conclusions were altered, presumably to tie up those occasionally loose, vaguely crestfallen narrative endings that Simenon sometimes dreamed up. "The new and freshly translated versions of Simenon’s novels that Penguin is publishing give us, for the first time, the opportunity to read them as he wanted them to be read,’’ he writes. Indeed, à propos of such denouements, you rarely sense a smacking of lips as justice is served - the valedictory tone is typically more rueful, even bemused than that, as Maigret dutifully, resignedly accepts that he will be woken up in the small hours once again. More knotted mysteries will come his way whether he likes it or not.